A paper published today in Quaternary Research reconstructs June-July temperature trends from the British Columbia Coast Mountains in Canada over the past 785 years from 1225-2010. The paper shows temperatures were as warm or warmer than the present  during many periods in the past including around ~ 1240, 1270, 1310, 1340, 1400, 1460, 1500, 1550, 1590, 1660, 1670, 1710, 1820, and 1930-1940. Reconstructed June-July temperature anomalies from 1225-2010 from Fig. 6 below. Added red line shows temperature anomaly at the end of the record in 2010. Figure 6. Reconstruction of air temperature anomaly ring-width variability AD 1225–2010. (a) June–July air temperature anomaly reconstruction. Gray lines represent annual reconstruction indices and the black line shows a 10-yr weighted running mean. 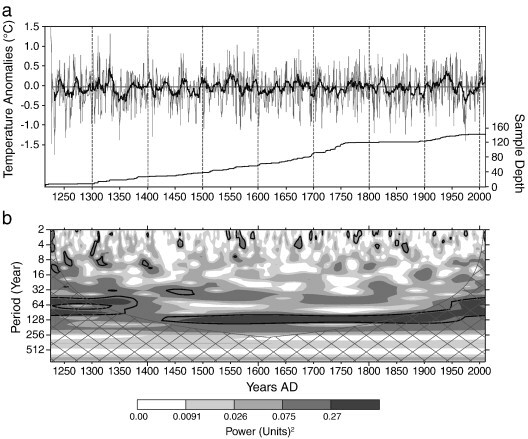 (b) Wavelet power spectrum of extended tree-ring chronology. Cross-hatched regions represent the cone of influence where zero-padding of the data was used to reduce variance using a Marlet-2 function. Black contours indicate significant modes of variance with a 5% significance level using an autoregressive lag-1 red-noise background spectrum (Torrence and Compo, 1998). Figure 7. Normalized air-temperature tree-ring reconstruction smoothed with a 25-yr spline. Vertical bars represent the number (50-yr increments) of dated central Coast Mountain Little Ice Age moraines reported by Smith and Desloges (2000), Larocque and Smith (2003) and Harvey and Smith (in press) in accordance with air-temperature trends. Most glaciers in the British Columbia Coast Mountains reached their maximum Holocene extent during the Little Ice Age. Early- and late-Little Ice Age intervals of expansion and retreat fluctuations describe a mass-balance response to changing climates. Although existing dendroclimatic records provide insights into these climatic fluctuations over the last 400yr, their short durations prohibit evaluation of early-Little Ice Age climate variability. To extend the duration of these records, submerged coarse woody debris salvaged from a high-elevation lake was cross-dated to living chronologies. The resulting chronology provides the opportunity to reconstruct a regional June–July air-temperature anomaly record extending from AD1225 to 2010. The reconstruction shows that the intervals AD1350–1420, 1475–1550, 1625–1700 and 1830–1940 characterized distinct periods of below-average June–July temperature followed by periods of above-average temperature. Our reconstruction provides the first annually resolved insights into high-elevation climates spanning the Little Ice Age in this region and indicates that Little Ice Age moraine stabilization corresponds to persistent intervals of warmer-than-average temperatures. We conclude that coarse woody debris submerged in high-elevation lakes has considerable potential for developing lengthy proxy climate records, and we recommend that researchers focus attention on this largely ignored paleoclimatic archive.